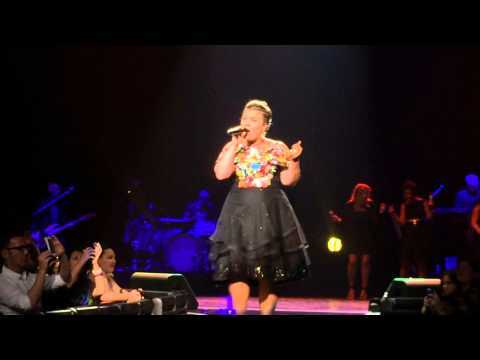 Kelly Clarkson proved that she could do no wrong when it comes to belting out tunes during her recent concert performance at New York City’s Radio Music Hall on Thursday, July 16th. The American Idol alum decided to do her own spin of Nick Jonas’ hit song ‘Jealous’. Kelly Clarkson told members of the audience that she was excited to sing ‘Jealous’ because she loves and is a fan of Nick Jonas’ music. Kelly Clarkson is known to take fan requests at her concerts. She has previously done covers of the hit songs ‘Stay With Me’ by Sam Smith, ‘Lose Yourself’ By Eminem, ‘Shake it Off’ by Taylor Swift ad Rihanna’s latest single, ‘Bi-ch Better Have My Money’. The 33-year-old singer is currently on the road for her ‘Piece by Piece Tour’ that started on July 11th. Kelly stated that Nick Jonas would be joining her on the Canadian leg of her tour when she wraps up touring in the U.S.